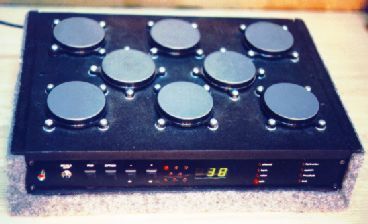 The MIDI Drum Machine began in the Fall of 1991 as a project for a microprocessor system design course, shortly after I wrote PAULMON1, the 8051 monitor/debugger. A friend, Rod Seely, both a musician and electronics hobbiest suggested I design something using the Musical Instrument Device Interface, MIDI, that would be COOL and would work together with his collection of MIDI keyboards and synthesizers. Of course, I wanted to build something that could end up as a finished commercial product. The project began with the MIDI interface, which we knew very little about, but had to use. After several weeks of late nights spent trying to understand the detail of the MIDI spec, tinkering with circuits, writing 8051 assembly code, reverse engineering electronic musical instruments, and some very nice carpentry and painting on Rod's part, the end result was the finished unit shown here. Shortly after it was finished, it was played by two experienced drummers, both of whom felt it had the "speed" and a set of features they'd expect from an expensive "professional" electronic instrument. Throughout these pages, TODO comments appear. These pages are a work in progress, though often times the word "work" seems a bit strong to describe the level of effort. This project was done in the Fall of 1991 (before the world wide web existed as it does today), and the project was not well documented. If you have questions or if I've overlooked some important details, please send me an email, but realize that I often times don't get around to responding to emails about freeware projects for a couple weeks.